In part 6, we introduce the youngest member of the Wolmer's Auditorium Project Committee – Colin Francis. A Registered Professional Engineer and Certified Energy Manager, Colin attended Wolmer's between 1984 and 1992 and participated in the school community through badminton, Key Club and Debating Society, and further recreationally through table tennis as well as lawn tennis. After leaving Wolmer's, he went to the College Of Arts, Science & Technology (CAST) and completed a Diploma in Electrical Engineering in 1995, which by then was upgraded to the University Of Technology (Utech). In 1998, he returned to the institution, and completed his Bachelors of Engineering Degree in Electrical Power. Colin's dynamic career include working at Alpha Tech Limited (September 1995 - 2008) and sister company Satyn Consultants Ltd. while simultaneously starting his own Electrical & Building Contracting Company firm C and C Professional Services Ltd with his twin brother, alum Craig Francis. In 2002 Colin and Craig also ventured into Fish and Pig Farming under their company C & C Farms. The farming venture although with great potential eventually closed in 2008 as a result of praedial larceny. At Alpha Tech, Colin worked his way up from Junior Engineer to Director of Operations over a period of 18 years. He eventually merged the company with his other company C & C Professional Services in 2005, which is now one of the leading contractors in the Electrical and Building industries. Being a strong leader, Colin has also moved up the ranks at Satyn Consultants and is currently the Chief Executive Officer. He has other interests in chicken farming, and other business activities including the newly acquired C & C South Beach Restaurant in New Kingston. Colin expressed that like his brother, he is always looking for new ventures that allow for the development of self, fellow Jamaicans and the country at large. Colin heard of the auditorium project through Craig, who was contacted by Trustee Douglas Orane. Colin immediately decided to join the project committee to design and consult on the electrical, ventilation and air-conditioning component and has further extended his support to cover the construction supervision all being pro bono. Through Craig and their electrical contracting company, they have further contributed by being the appointed electrical contractors for the fit out of the auditoriums needs. After 23 years without an auditorium, the students at Wolmer's Boys' have had to endure the harsh weather conditions for Assembly and various presentations, which are held outdoors. Thanks to the initiative of the Wolmer's Trust, led by Trustee Douglas Orane, a new auditorium will become a reality by the end of the 2014/2015 school year. This series entitled: “The Story Of The Wolmer's Auditorium" will highlight the members of the project team, most of whom are Wolmerians, and almost all of whom have donated their time free of cost to design and construct the Auditorium. We begin the series with Mr. Lauriston Jones (alum 1949 – 1955) who is the Quantity Surveyor on the project. Laurie as he is affectionately called, attended Wolmer's between 1949 and 1955 on a government scholarship from Central Branch Primary. His early career plans were set in the sciences, but he decided to put that plan on hold after receiving a job right after leaving Sixth Form. He went to work at the Ministry of Works Public Works Department (PWD) on Maxfield Avenue, Kingston from 1955 to 1958 in the Water Supply and later the Irrigation & Drainage Branch. Laurie left PWD to begin his technical studies in the first cohort at the College of Arts, Science & Technology. He only spent two terms there as he won a government scholarship to pursue a Diploma course in quantity surveying at the Regent Street Polytechnic later to become the University of South London. After graduating he took the examinations of the Royal Institution of Chartered Surveyors and became an Associate of the Institution in 1968. During this period he worked with a private quantity surveying firm R. T. Dadson and also at the London County Council and the National Building Agency. He returned to Jamaica in 1969 and took up a position at Rutkowski, Bradford & Partners a firm of Architects, Engineers and Quantity Surveyors in their quantity surveying section. Laurie moved on to the Ministry of Works in 1972 as Chief Quantity Surveyor, where he spent the next three years. In 1975, he left the Ministry and became a Partner in the quantity surveying firm B. G. W. Cawston & Partners, where he still is, nearly forty years later. 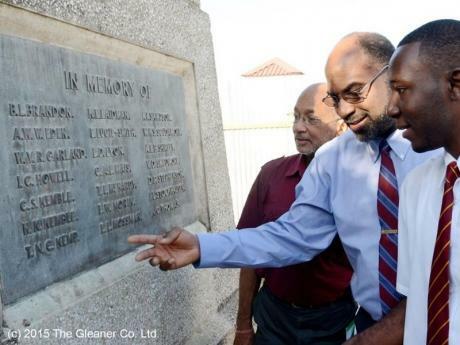 When he was asked why he was volunteering his time and expertise to the auditorium project, he said it was about time that he gave back to Wolmer's. He was approached by alum and civil engineer Tommy Lyew and he never hesitated. “I feel privileged to assist with the construction of the auditorium. When | attended Wolmer's there were about 300 students. I was surprised to learn that sixty years after I left, the Wolmer's schools now have a total enrollment of over 3,500 students, of whom 1500 are at the boys' school. What also struck me was seeing that most of the original buildings were still intact." Laurie's message to current students: "Always keep up the fine tradition of Wolmer's. Being a Wolmerian is something to be proud of and our tradition requires that our standards be kept extremely high." In part two of our series on the Wolmer's Auditorium, we feature alum Tommy Lyew who is the structural engineer on the project. Tommy attended Wolmer's between 1948 and 1951 after a short stint at St. George's College. After leaving sixth form, he started his career at the Barclay's Bank (now National Commercial Bank) but realized after three years in the job that banking was not for him. He left for the United Kingdom in September 1952 to study engineering at the Battersea College, University of London. After graduating, Tommy's internship was at Ove Arup & Partners where the experience was at a higher level than what he was exposed to at the undergraduate level. In the true Wolmerian spirit, he went back to pursue his post graduate studies so that he could better appreciate the challenges of engineering. He received the Department of Scientific and Industrial Research (DSIR) Scholarship to complete his Master's in Civil Engineering at Imperial College. Despite an offer to take up a lucrative job at Ove Arup & Partners, Tommy decided to return home in January 1961. Almost immediately, he was appointed the Resident Engineer for the building of the National Stadium, which had to be completed by April 1962 in time for the Commonwealth Games. After completing the National Stadium, he went to work at Alcoa Minerals where on one of his excursions, he met and became lifetime friends with a young businessman by the name of Francis "Paco" Kennedy. Paco was very impressed with Tommy's engineering ideas and encouraged him to start his own business, which he did with two other friends: Lloyd Hue and Noel Chin. That business, Hue Lyew & Chin is one of Jamaica's most respected engineering companies today. Tommy's engineering skills can be seen at the Scotia Centre, Seabed Authority Centre and the National Gallery to name a few. Tommy is encouraging current students to pay close attention to the changing World of technology. “You should consider engineering and other technological studies as viable career options" he said. “I am happy that I was able to advise Wolmerians such as David Goldson and Yannick Eatmon to consider engineering as a career. In fact, David is now one of my partners at Hue Lyew & Chin and Yannick is doing well at MIT where he is studying Chemical Engineering. I hope more Wolmerians join the field of engineering in the near future." Alum Paul Thorbourne is the architect for the Wolmer's Auditorium. He attended Wolmer's Boys' from 1961 to, 1968 and was a member of both the track team and combined choir. Paul knew he wanted to become an architect from an early age and therefore decided to leave Wolmer's at the end of Lower Sixth to study for external exams in more relevant subjects. He spent the next half year working as a sales clerk for office equipment and supplies at Bryden & Evelyn and attended classes after work. He also played keyboards in a Band which eventually morphed into the "Inner Circle." With the help of his parents and a relative, he got the opportunity to leave for New York in 1969 to continue working while enrolling for part time studies at the City University of New York. After two years he was accepted in the School of Architecture when he applied for and was awarded a Jamaican Government Scholarship to complete his Bachelor of Architecture Degree. He returned to Jamaica in 1975 and worked at the Ministry of Works for the next eight years which culminated in him being appointed Chief Architect. Although he enjoyed his tenure at the Ministry, Paul wanted to be more involved in building design and took the bold step in 1983 to go out on his own and has since operated his own firm, except for a brief three year stint when he worked in a friend's office in Washington D.C. from 2000 to 2003. His designs include buildings for the Churches Cooperative Credit Union head office (Now First Heritage), New Ministry of Finance Office(National Heroes Circle), Jamaica National Building Society office in Half Way Tree, Campion College Auditorium and the monument for the late Prime Minister Hugh Lawson Shearer, which now stands at the National Heroes Park. Paul was contacted by alum Tommy Lyew, who referred him to Douglas Orane who had decided to put together a team of old boys to undertake the project to design and build the new Wolmer's Auditorium. Paul immediately accepted the offer to be the architect. . He produced a design based on the needs of the various stakeholders, the land space available, and a market survey done to determine the desires of those who may want to rent the auditorium for functions." I have great memories of Wolmer's and it was the least I could do as my contribution to the school that helped make me what I am today." His wish is that more students would pursue their passion based on their talents when choosing a career path. “Once you are doing something you love, it will lead to a more satisfying life. I know it worked for me and hope more Wolmerians will evaluate their natural talents to see how best they can assist in nation building." David Goldson regards himself as a true Wolmerian as he is an old boy of both Wolmer's Prep (1970 – 1977) and Wolmer's Boys' (1977 – 1984). In fact, David was at the prep school when it was relocated from Arnold Road to its present home on Connolley Avenue. Additionally, David is the second of three brothers who also attended Wolmer's. After his successful Common Entrance placement at Wolmer's Boys, David involved himself in several extra curricular activities including Swimming, Water Polo and the Photo Club. Starting in Fourth Form, David spent his summer holidays at Hue Lyew Chin (HLC) learning the basic elements of structural and civil engineering. He was so inspired by the work experience that he chose this field when he left to pursue his Bachelors of Science Degree at the University of New Orleans. He returned to Jamaica after completing his first degree and worked with HLC for eight months before leaving for the University of Florida to study for his Masters in Structural Engineering. David worked in construction for a few years but after receiving a call from Tommy Lyew, he returned to HLC in 1999 where he is now a partner With the firm. David was the lead engineer on several projects across Jamaica including the Scotia Bank buildings on Constant Spring Road and Montego Bay as well as the luxurious Sandals Resort property in Grenada. David was informed about the Wolmer's Auditorium project by Tommy Lyew and he decided that he could not let this opportunity to give back to Wolmer's go by. “I knew that I had to be involved in this historic exercise at Wolmer's. This school has done so much for me and this is the lease I could do to contribute to Wolmer's development. I am very proud to be a part of this team." David followed his dream of being a structural engineer and wants to encourage existing students to do likewise. “It doesn't matter if you are not academically inclined, follow your passion and you will find something fulfilling." Wolmer's Trust High School for Boys yesterday signed a construction contract with Bruce English & Associates to build a modern new auditorium funded by donations. The 11,800 square-foot building, which will accommodate up to 2,300 people, will have a stage for theatrical performances, a mezzanine floor, and meeting rooms. The multipurpose facility is large enough to accommodate a basketball court and facilitate other indoor sports. The building should be completed by April 2015. Dr Walton Small, principal of Wolmer's Boys' School, describing the development as exciting, said, "For over 23 years, the school has not had an auditorium since the previous wooden hall was destroyed by fire in January 1991. At last, the boys will be out of the sun and rain for their morning assembly." He expressed his gratitude to board of trustees, alumni, parents and friends of Wolmer's, who he said were making the auditorium possible through their donations. "In particular, my gratitude to trustee Douglas Orane, who is leading the fundraising initiative." Orane said the auditorium is being funded completely from donations. "There are alumni who have so far been generous in their contributions to date. We now need every member of the Wolmer's family to contribute - no matter how small - to make our dream become a reality," he said. The facility will be used by all three Wolmer's Trust schools, namely the boys' high school, the girls' high school, and the preparatory school. It will also be available for rental to third parties for functions to help generate income for the schools. 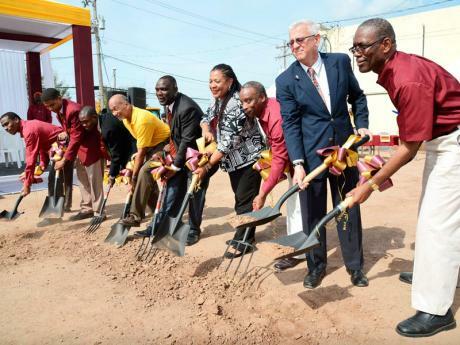 From left: Daveyton Blake, president of the parent-teacher association; Darren Angus, students' council representative; Kirk Benjamin, old boys' association president; Douglas Orane, trustee; Dr Walton Small, principal; Pauline Findlay, board chairman; Milton Samuda, trust chairman; Education Minister Ronald Thwaites; and Lincoln McIntyre breaking ground for the Wolmer's Boys' School's new auditorium during a ceremony yesterday. The Wolmer's Boys' School in Kingston is hoping that the construction of its multimillion-dollar auditorium will open the window for students to be more rounded, especially in the creative arts. Principal Dr Walton Small, who was speaking with The Gleaner following yesterday's ground-breaking ceremony at the institution, noted that the lack of space restricted some aspects of extracurricular activities. "We have been limited in terms of the students expressing their artistic abilities because we do not have the space and so with this [auditorium], we are going to see a different side of Wolmer's,"said the principal of the 285-year-old institution. "Our students will be excelling even more in the performing arts and indoor sporting events because we do not only believe in academic development, but we are of the opinion that a student should understand the importance of balance," he declared. He added: "When we have activities that require students being outdoors, we have to transport them all the way up to a facility near Stony Hill, and it is really expensive, both financially and physically, and so I'm looking forward to great things." Small also appealed to organisations and various businesses to assist in filling a $43-million gap in meeting the $170-million target for building the auditorium. Education Minister Ronald Thwaites, who was the guest speaker at the event, implored persons in the education sector to do all they can to enhance the holistic development of students. "In addition to the academics, let us embark on initiatives within our schools that will build the character of our students. One cannot overemphasise how important it is for our youth to be driven in purpose and accomplishment," he said. "I also encourage persons who are members of churches to find Jesus outside of your sanctuaries and go into the schools because it is there you will engage with the little children and fulfil the mandate of Christ," he urged. It is 7 a.m. on Monday, January 7, 1991 and Negash Davidson, first former at Wolmer’s Boys’ School makes his trek to school, ready for a new term. What he thought would be a regular day has been one of the most eventful in the school’s history. “As I turned the corner of Marescaux Road onto National Heroes Circle, I saw clouds of smoke coming from the direction of the assembly hall and when I reached the campus, students and teachers gathered and watched in distress as firefighters doused the flames,” Davidson recounted. Twenty-four years later, Monday and Friday morning assemblies evoke mixed feelings among students who stand in the sun for the duration. However, at the same time they gladly meet graduates who are making a change. “We have been without a suitable auditorium for 24 years and I am happy that the students will be out of the sun and rain for morning assembly as of May this year,” said Dr Walton Small, Principal. Construction of the state-of-the-art facility started in August 2014 at a cost of $171-million under the guidance of an alumni-led team. The facility will cover 11,840 square feet, accommodate 2,300 students standing and 1,800 seated and will be available for use by Wolmer’s Girls’ and Wolmer’s Preparatory Schools as well as the Boys’ School. “We need $34-million to complete the project and there are a range of intensive fundraising activities underway. One such initiative is a brick drive led by the Parent Teacher Association which allows donors to engrave a message on a brick for a minimum contribution of $10,000,” he said. Architectural design is geared at sustainability as it includes natural ventilation for the main auditorium space in addition to a solar electricity system on the roof which will save the school approximately one-third of its energy bill. Additionally, water harvesting from the roof will lead to an underground tank which will augment the school’s water supply. Dr Small is elated that the new facility will enrich the students’ experience. “The auditorium will host school functions such as graduations, performances and assemblies. Furthermore, our students who play badminton, basketball and volleyball and participate in the performing arts will now have a new home,” he said. The facility will be outfitted with a mezzanine floor inclusive of two meeting rooms which will be employed as additional teaching space.